Even though 2018 has passed and 2019 is now here, choosing the best telescope for you may still seem like a daunting task. Don’t fret! With the right information you’ll be prepared to sort through the hundreds of models available. Before you can fully understand customer reviews and find what’s best for you, it’s important to have a basic knowledge of the parts of the telescope and to have an idea of what you’ll be using your telescope for. You should also consider the price range (a couple even cost less than $200) and the amount of time you’re willing to commit to learning how to use your telescope. In our opinion, the following 6 telescopes are among the best on the market. Of course the most powerful ones in existence cost millions of dollars, but below we have a comparison chart and brief overview of the the best affordable scopes on the market. Make sure to click on the product subheadings for more in-depth review of each scope. While the NexStar might ring up at the uppermost price range of what most beginners are wanting to spend, it truly is (in our opinion) one of the perfect telescopes for amateurs. The reason? Well for starters the 127 SLT is a computerized telescope making the initially daunting task of locating celestial object infinitely easier. Many beginning astronomers get discouraged, and indeed even give up, after spending hours trying to finding the objects on their sky maps. Starting out with a computerized telescope completely eliminates that frustration and enables beginners to be able star enjoying night watching immediately. The NexStar 127 is the perfect balance of quality and price point. Celestron telescopes are arguably the epitome of the quality scopes, and this is a lower-mid range telescope in the NexStar line. Serious beginners will more easily find more enjoyment (and by extension motivation in regards to astronomy) with the NexStar 127 SLT MAK than they would with most other telescopes. With nearly double the aperture size of the 10014 SkyQuest this telescope is the priciest on our list, but it’s also the highest rated. The quality of image this scope produces is on par with the levels required by professional astronomers. Although it does come with a higher price tag, it is money well spent as you definitely get the most out of each dollar. The Orion 8945 is suitable for all levels of stargazers. While many budding astronomers buy a low range scope in the beginning, those who stick with it often feel the need to purchase a better one within a year as they advance in their skill. That is not an issue to worry about with this choice. The XT8 will satisfy the clarity cravings on all skill levels. An additional attachment can also be purchased to attach a camera to this telescope for video and photography. Like with a few other scopes on our list, the Starry Night astronomy software is included in the package. This is great for newcomers to the field, but won’t be necessary for those will a little more experience. The assembled piece weight about 40 lbs, which is a bit more bulky than the other scopes. This can make it a little more difficult to transfer if you plan on sky watching in different locations. However, this is to expected in this industry. The higher power the scope, the bigger and less convenient it will be to transport. Either way the Orion 8945 SkyQuest XT8 is most likely the best choice for those who know that their passion of viewing heavenly objects will not quickly fade. If you want a scope that you certainly won’t feel compelled to replace within a few years, the XT8 is strongly recommended for you. The 127 EQ PowerSeeker is a relatively powerful telescope especially when you consider it’s price point. It is for this reason that it is included on our list. While it is actually the least powerful scope on the list (aside from the travelscope which sacrifices power for portability), we decided to include it for those constrained by a tighter budget. If you only have a couple hundred to spend on a telescope, and don’t foresee yourself upgrading within a couple of years, then this is a great choice. This may also be the preferred choice for parents looking to buy their children a decent quality telescope to help feed a growing passion. The setup of the PowerSeeker is super simple and requires no tools. In fact, within minutes of unpackaging, you can be viewing brighter planets and nebulae at up to 300x magnification. The quality of components used are nothing short of what you would expect from any Celestron product. The two included eyepieces (20mm and 4mm) will keep you busy for many months to come, and as with any scope, you can always upgrade lenses later on as you learn to become more technical in your viewing. The software “TheSkyX” is included in this package and contains thousands of database objects that you can search for. Overall, this is the prime choice for those looking for a serious telescope for as cheap as possible. While not quite as wide as the Starblast, this Orion telescope is actually a bit more bulky weighing almost five more pounds. It is also noticeably long due to it’s longer focal length. Like it’s relatives on this list, the Skyquest is a solidly built. You can tell at first glance that many of the cheaper scopes on the market have flimsy bases are were made with “cost saving” materials. On your first encounter with the Orion 10014, you know that it’s anything but cheaply built. This is a scope that will last you years. It’s wheeled mount allows you to easily transport it around the home or any other flat surface. Be aware that when viewing, it’s eyepiece doesn’t stand very high off of the ground so larger adults may need to hunch over to look through it. It also includes TheSkyX software to help beginners map out the night sky. The 10014 is actually the smallest of the Dobsonian scopes that Orion offers. It is marketed for it’s portability, and is a great solution if you want to observe while traveling about, and want something much more powerful than the Celestron Travel Scope. This is a great mid-range tool, well priced for those who want an amazing view, but aren’t yet ready to pay a higher price to join the professionals with top of the line equipment. The PowerSeeker 70AZ isn’t brightly colored with cute pictures painted on the box, so why do we feel it’s perfect for a child? First of all understand that this scope is an actual real telescope, not just some child’s toy. It is well priced, and available for not much more than many scopes much less powerful that are marketed directly to children. The price of course is an important factor in making it a feasible choice for parents looking for a great present for a child showing interest in astronomy. However, the quality of the view that the 70AZ delivers (which is many times better than most children’s scopes) ensures a rewarding experience for children of all ages, which can help a child foster and grow into a wonderful and fulfilling hobby. Unlike many other products you may consider, this PowerSeeker will not break after a few uses, and will certainly last for many years to come. This is the perfect telescope for parents wanting to buy a great tool that their children can use to foster a real appreciation of science and heavenly bodies, instead of children’s toy which might be used a few times at best. Sometimes great things come in small packages. The 70mm telescope is a prime example. While being, by far, the smallest and most inexpensive scope on the list, what it lacks in power and size it makes up for in convenience and mobility. Many night watchers like to travel to picturesque locations where the sky may be more open, or far outside of the city where there is less ambient light. For such observers, packing around some of the larger apparatuses available just isn’t feasible. The Celestron 21035 Travel Scope was made with these people in mind. It comes with both a tripod and a carrying bag which make it easy to drive out to a new location, set up the tripod mount, and begin star gazing all in a matter of minutes. It is also a great buy for parents who have younger kids who may express interest in astronomy, but are unsure whether this interest will grow to be lifelong passion or a soon-to-be fleeting hobby of the past. In such cases, parents may not want to invest the amount of money that high quality telescopes demand. Such parents will also be well pleased with this Celestron. While many characteristics of this scope are to be appreciated, it admittedly has a significantly smaller aperture than the rest of the pack. This means that it is also significantly less powerful – although it is still many times more powerful than staring at the stars through binoculars! Interested parties should also keep in mind that although it is meant to be portable, it is still a delicate instrument with glass lenses and owners should be delicate in packing it around. If you aren’t looking for anything particularly powerful and plan on observing in many different areas, then you’ll be hard pressed to find another telescope of this quality built for travel. This is a great choice for new astronomers. Crafted by well-known manufacturer Orion, this is a really solid reflector telescope. The 10015 StarBlast comes with a good-sized 4.5 inch aperture, two Explorer telescope eye-pieces, and includes the Starry Night computer software which helps those just starting learn how to use their telescope. It comes with an altazimuth table top base which is great for portability for around or near the home. mount is perfect for use in a backyard or on a deck. Those looking to use this telescope in a field or other areas which don’t cater to the wheels on the mount, may want to consider another comparable scope. While this product comes strongly recommended for beginners, more advanced viewers or quick learners may be put off by some of the limitations the come with purchasing a product geared for beginners. With it the craters on the moon and constellations can be seen in many times more detail than with the naked eye or binoculars. While you should be able to achieve a clear view of celestial objects, extensive astrophotography would be a task better performed on something a little more powerful. The aperture is a great size for it’s intended use, but advanced star-gazers may prefer something a little more powerful. To sum it up, this is a great home telescope for the family. The aperture of the telescope is the most important factor to consider and should be chosen carefully. The aperture of a telescope is the main lens or mirror, and can be thought of as the magnifying glass of the telescope. The bigger the aperture, the larger the magnification and images will be sharper and brighter. The aperture is also important because it allows you to see fainter objects; most often the issue with astronomical objects is not that they’re too small, but that they’re too faint and dark. Due to the importance of the aperture, many believe that you should always buy the telescope with the largest aperture available, but this isn’t always the case. If your intentions include leisurely star-gazing, then a smaller aperture will suffice. If you plan on examining fainter objects, say fleeting comets, it may be wise to invest in a more complex telescope with a larger aperture. Altazimuth– This is the simplest type of mount that you can find. Altazimuth mounts are best suited for light terrestrial-viewing and are good for smooth movement when gazing the stars. Dobsonian– This is a modified version of the altazimuth; it is mounted on a large platform and tends to have larger apertures. A Dobsonian mount is best suited for more advanced terrestrial viewing. Equatorial– These are unique from altazimuths in that can be easily guided throughout the night sky. Equatorials have either manual slow-motion controls or an electric motor that help to follow astronomical objects. Equatorals are best for very advanced terrestrial viewing and are vital if you plan on trying out astrophotography. When shopping for your first telescope it’s important to understand what you’re getting yourself into. Choosing the correct telescope for you involves time and research to ensure that you’re making the right choice. Although it may be tempting to reach for the kid’s telescope in the bright, enticing packaging, or the cheapest telescope available this is most likely not the smartest investment. It’s important to understand that you don’t always need to splurge on the most expensive model; the model that best suits your needs may be a more affordable option. Also, when using any kind of telescope it’s important to read any instructions or manuals to ensure you’re using your scope to the best of its abilities. With the right knowledge you’ll be able to purchase your first telescope and be star-gazing in no time. The concept of using mirrors as a form of gathering light and images and then diverting the mirrored image so that it can be viewed by the human eye was born when Isaac Newton was struggling with the Halo Effect. This concept led to the design of the first reflector telescope. Though the original design was bulky and primitive, the reflector telescope has been continuously redesigned to create a slim telescope that is currently the most commonly used telescope today. The reflector telescope has internal mirrors that will capture an image and then reflect an image into a telescopic lens. It’s the preferred choice when viewing astrological sights, such as star constellations, other planets and the moon. The process of obtaining light and images through a reflector telescope is dually ingenious and simplistic. A primary mirror is placed at the back of the telescopic cylinder or tube. This mirror captures all incoming light from an object that’s being viewed. A secondary mirror is placed at an angle in front of the primary mirror. This secondary mirror will capture the reflection from the primary mirror and then reflect an image into the viewing lens, allowing a clear and precise image to be viewed by users. Reflector telescopes have superior focusing abilities through the act of light gathering and reflection. This allows easy viewing of astrological images that are furthest away from Earth. Viewers are able to obtain clear and bright images of several far off clusters that otherwise would have been impossible to view. Overall reflector telescopes are preferred for most telescopic uses. The only limitation that some users have found is a lack of light capturing. The reflective secondary mirror is said to block a minuscule amount of incoming light. The refractor telescope was the first of many telescopes to be made and used by those with a desire to see far beyond what could be taken in by the naked eye. It was through the combination of the refractor telescope and the reflective telescope that the compound telescope was invented. During the early 1600’s, astronomers sought to see further into the sky and were able to achieve their desires by expanding on the common spyglass of their times. This led to the invention of the refractor telescope. The same glass lens that were used in spyglasses were created on a grand scale and placed inside of the cylinder of a refractor telescope, for the gained ability of bending light, this allowed astronomers to pull in clear visible images that were unobtainable by simple star gazing. By amplifying the abilities of a glass lens, the refractor telescope is able to provide improved focus. At the end of the telescope cylinder, at least one lens and often more than one lens will draw in light. As the light passes through the lens and down the length of the telescope tube, the initial light is bent. The light which has been bent is then able to pass through a smaller lens known as an eyepiece. Light can then be seen through the users actual eye. The interesting and innovative fact of how the refractor telescope works is that when it was originally being designed, the initial inventors were able to get simple glass to bend light in the same way that the human eye will pull in light and them flip it or bend it. 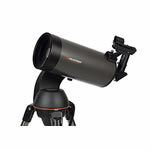 Refractor telescopes have several focus range capabilities through lens accessories. This is primarily due to the fact that the smaller eyepiece can be interchanged, much like your common non-digital camera. Each lens offers an enhanced range of focus. This basically allows users to view far off objects and closer objects with the same clarity. The refractor telescope is ideal for any user that enjoys gazing into the deepest galaxies and viewing cities from afar. The design of the refractor telescope, though in many ways innovative has inconsistencies in viewing that can create a disadvantage over other options. Incoming light is bent and therefore not filtered, this can create excess colorization. It still provides a clear image, many users have found that the minimal amount of colored specks that are drawn in are insignificant and therefore lack the magnitude to interfere with telescopic imagery. By taking the best points of past telescopes and combining them to make the compound telescope, also known as the catadioptric telescope, a modern and versatile telescope was created. The compound telescope uses both glass and mirrors in order to provide a clear image, regardless of distance. By using the best design features of each telescope, the compound telescope was created. The compound, though not perfect is an enhanced version of historical telescopic inventions and a testament of innovativeness. A compound telescope has a glass lens at the outer base. This lens will draw in all incoming light and then bounce or bend the light to a large mirror. The light is then picked up by a small mirror attached to the lens positioned in the outer base of the compound telescope. The small mirror will then reflect an image into the eyepiece located opposite of the mirror. This advanced light manipulation creates a perfected image. By using the combination of mirrors and glass, the compound telescope eliminates viewing issues that were found in telescopes created previous to the compound. The mirrors that were used in reflector telescopes created a slight blockage to incoming light, this is eliminated by placing the mirror at the end and by the path that light takes within the compound telescope. Additionally, color fragments that were pulled in through the refractor are completely eliminated. The result is a viewable image that is free from colorization caused by halo effects. The dual reflection of bent light can at times limit the width of images. This is seen mostly when viewing large objects such as the moon or planets within the solar system. The compound telescope works best when examining star clusters. Since the time of Galileo and his discovery of Jupiter’s largest moons in January 1610 through his telescope, people have been constantly fascinated with being able to see what lies beyond the world realms of Earth, from it being depicted in literature, such as the celebrated A Hundred Years of Solitude, with the famous quote ‘Science has eliminated distances’ to the constant development and research into astronomy, such as the landmark launch of the Hubble Telescope in 1990. However for those who are new to this fine art may find it somewhat frustrating to not instantly be able to view those magnificent planets, satellites and asteroids. Therefore this article will attempt to point those in the right direction. Though it may seem tempting to dash to the nearest shop, run home and rip apart the box in haste, it is better to wait for the right night (considering factors such as light pollution, location, gradient of ground) to being stargazing through your telescope. Once a suitable evening for astronomical activities has been found, it’s time to set up your telescope with an equatorial mount, aligning the axis to the pole star. Once you’ve prepared everything (including taking off the lens lid!) get ready to take aim on that star, and use either the slow motion cables (attached to some models) or move your telescope manually to follow the ‘path’ of the star. When finished for the day (or evening, should I say! ), replace the dust caps and let the lens air-dry to avoid possible scratches made whilst handling the lens. 1. Only clean the lens if it significantly impedes sight. 2. Use compressed gas to clean the lens, venting gas away from the lens first as a precaution. 4. Use a wet cotton ball to clean the lens, cleaning in straight strokes. With that said, there are entire worlds, planets and Solar Systems itching to be discovered with your naked eye! So what are you waiting for?